The thing you always have to remember about Chinglish is that we are not the intended audience. English is used generally as a signifier of cosmopolitan modernity, and the vast majority of the people who see an English word will not even take the time to register it, let alone try to work out what it means. These characters are there for decoration, and that is their only function. 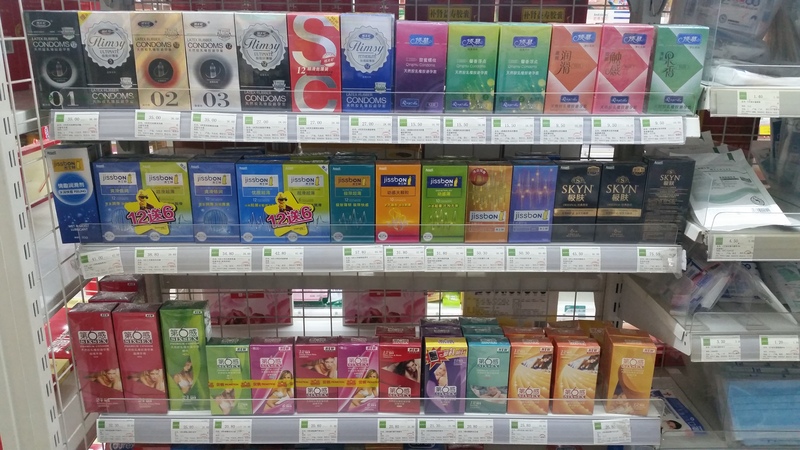 So, bearing that in mind, here are the brands of condoms on sale at the pharmacy downstairs. Let’s have a closer look at a few of the more interesting ones. 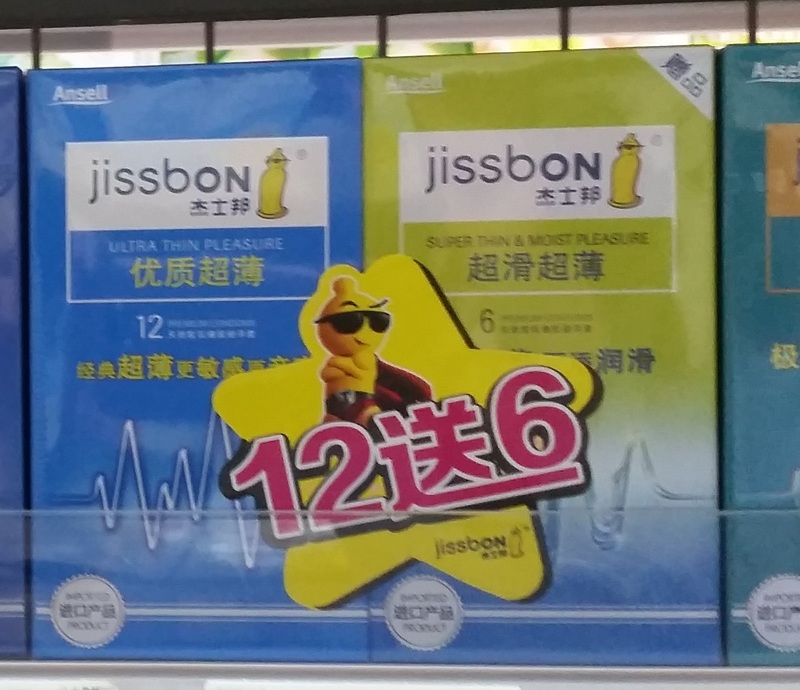 These are called “sixsex” – I assume this means there are six condoms in the packet, but the one on the left says 12, so now I don’t know what to think. “Jissbon” – ah oui, le jiss, il est bon, mais ceux-ci ne l’arrêtera faire un bébé. 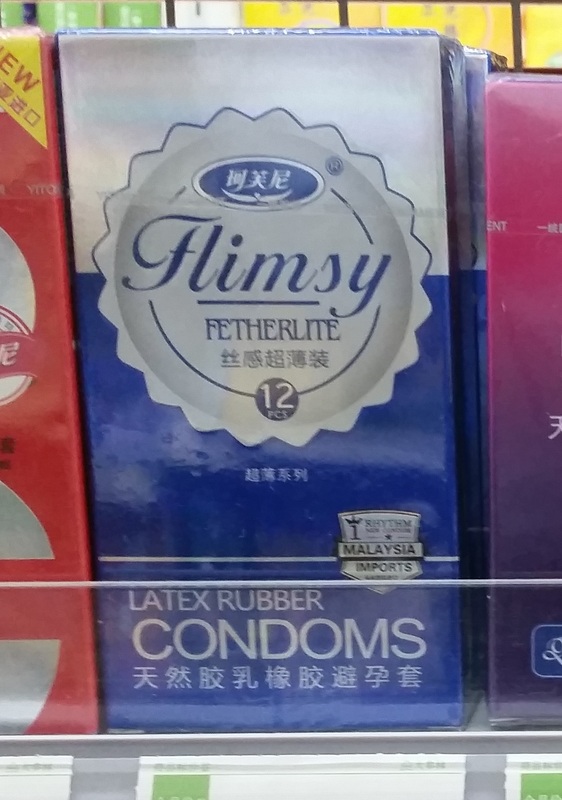 “Flimsy” – obviously this one is my favourite, and I can sort of imagine how they accidentally chose the worst possible name for a condom – i.e. that they mean it’s light and thin, and not that it’s easily breakable. But still, Flimsy. Flimsy brand condoms. This entry was posted in diary, things in china and tagged chinese brands, chinese condom brands, chinglish, condoms, flimsy. Bookmark the permalink.